Ok… I will only give you the truth and nothing but the truth. Students, Corpers and those seeking extra income online should read carefully. 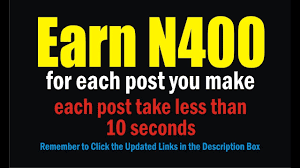 This is a new online advertising company or website (as you may wish to call it) that pays you nothing less than N400 to post adverts in form of links on your Facebook and twitter page every single day. This is no Ponzi scheme but to join this website you have to pay a monthly premium subscription fee of N3000. This according to them is to prevent people from opening multiple accounts and to tell you the fact, they are serious with what they do. Recad Media is a Digital Marketing Agency with roots in direct marketing, Recad Media Inc is the first company in Nigeria to promote Advertisers content by sharing its revenue with her members thereby creating an effective means of maximizing the use of “Social Media” as a digital marketing agency. #1 duty as a Recad Media’s publisher is to share the sponsored adverts seen on your dashboard account to your Facebook page and twitter page. Although you can make up to N2000 per day here but this will only depend on the number of posts you find on your dashboard. Take advantage of the opportunity to earn extra income online with your phone or computer as well as your social media accounts. You may be wondering about how much you will make within a month considering the monthly subscription. To answer this, i would say the earning potential with this money making method is nothing less than #12000 if you share one article or advert per day. NOTE: You are not guaranteed of making six-figures on this website but you will surely earn decent amount every month and you will be paid directly into your local bank account. For further enquiries please use the comment box or send me an email.